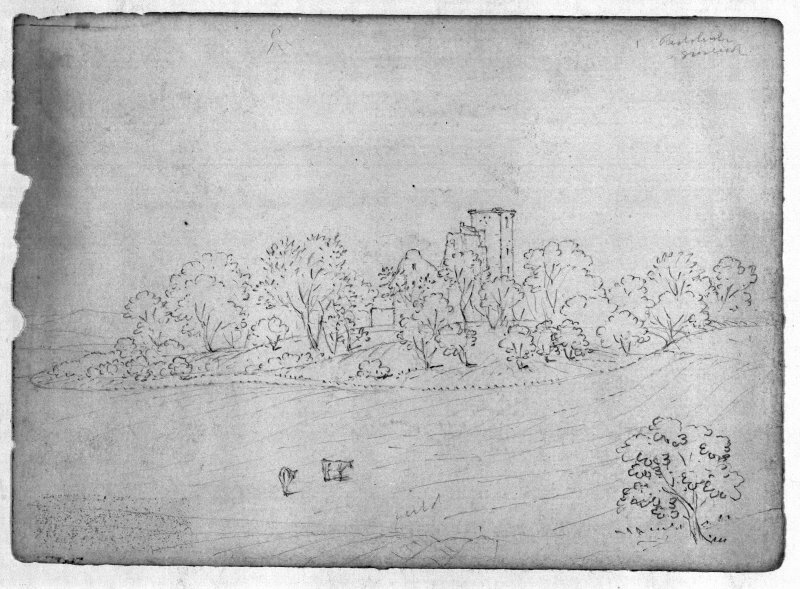 Photographic copy of George Stewart sketches: 'Ruins of Crookston Castle from the South. The moat is very perfect all round & about 8 or 10 feet deep in some places. Kilpatrick hills in the distance. 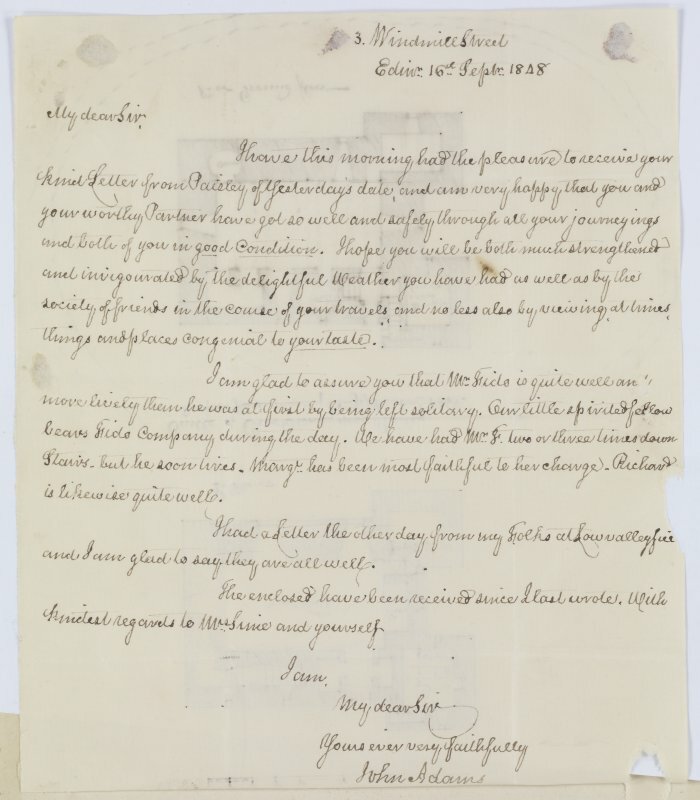 June 1865.' Pencil. The second oldest remaining building in Glasgow, after the Cathedral, Sir John Stirling-Maxwell presented the Castle to the National Trust for Scotland in 1931 as its first property. A remnant of a massive stone towerhouse, set high on a hill. Very unusual plan, continental, comprising central three-storey rectangular block of ashlar-dressed rubble framed by four taller square towers, one surviving to wallhead. 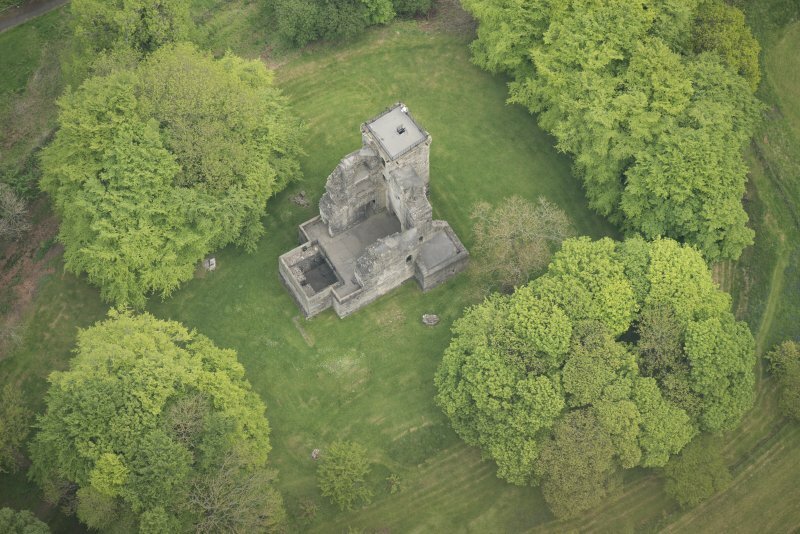 Beautifully built, it is now a consolidated ruin, cared for by Historic Scotland. Historic Scotland, open to the public, guide book. Two major periods are represented at this site; there are the earthworks of the late 12th century castle of Robert Croc (c/f NS56SE 32 and NS56SE 33 NS46SE 3) within which are the substantial remains of an early 15th century tower of unusual type. This became disused by the end of the 16th century. Talbot carried out excavations for the DoE in 1973-4. 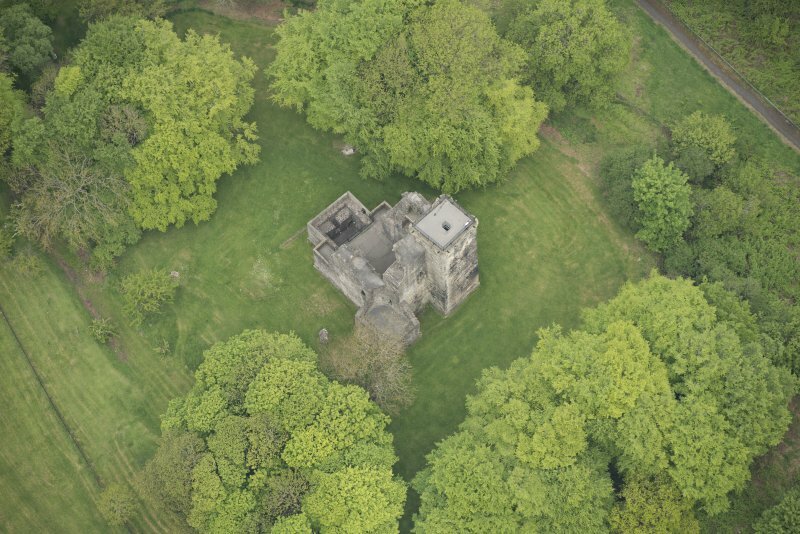 A building, about 15m x 8m, the foundations of which were visible at the E end of the enclosure was traditionally said to be the private chapel, known to have been built within his precincts by Robert Croc about 1180. Clearance of the area revealed a building of some importance, with a hearth in the S wall. Scarping of the slope around the 15th century tower may suggest that a motte was once present. Excavation N of the castle showed that this scarping was due to stone debris, not an earthen mound. Possibly a barmkin wall was associated with the stone castle. No defence features were located on the shoulder of the slope to the ditch but on the counterscarp bank the top was found to be covered by cobbling, as was an area lower down towards the ditch, giving a stepped effect. Other excavations were carried out by Talbot within the stone castle and around its towers. In 1975, an area was opened up N of the entrance, within the defences. A stone building was uncovered at right angles to the entrance gap. It was set upon the slighted bank of the 12th century ringwork; this bank had been very carefully levelled (probably in the early 15th century when the tower house was constructed) to create a flat platform into which foundations had been cut. It was impossible to date or interpret the use to which this building had been put. Other indications of walling within the area investigated seemed to indicate a use for farm purposes. To further investigate the possible barmkin wall, a cut was made completely through the scarp at its NW corner. This revealed no evidence for a wall returning on the W side of the scarp but the great depth of rubble encountered would seem to suggest a great amount of collapse and robbing. Beneath the rubble, a horizontal layer of occupation (no dating evidence from it) indicated that the tower house must stand upon a pronounced knob of boulder clay. 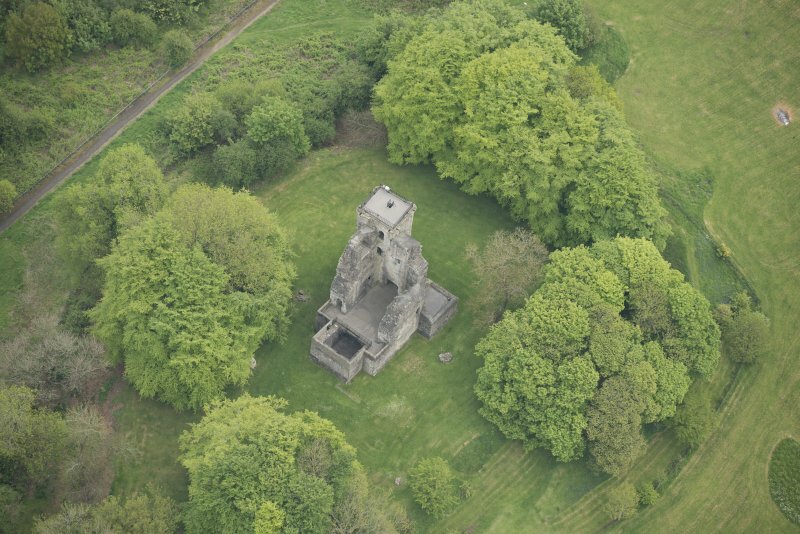 A geophysical and topographical survey of the site was carried out in 1998-1999 by D Maguire. No trace of a motte was found, indicating a simpler ringed defence work. 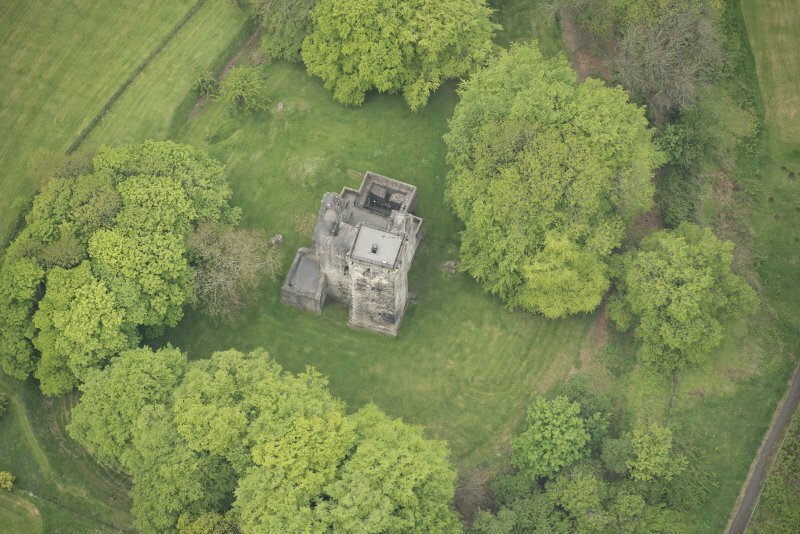 It is suggested that the structure excavated by Talbot is the chapel founded by Robert Croc in 1180. A circular enclosure, c.20m in diameter with internal sturctures of some type, was discovered below the surface outside the present limits of the castle. This enclosure is likely to pre-date the 12th century castle. NS 524 628 A geophysical and topographic survey was undertaken at Crookston Castle (NMRS NS56SW 4) in October 1998 and November 1999. The object of the survey was to determine the extent of any remains that may lie below the surface of the bailey and the surrounding area. The survey was carried out in two phases over two years, the first phase consisting of a preliminary resistivity survey, in the light of which the survey was extended in November 1999 to encompass the whole bailey and the area to the E of the present castle. 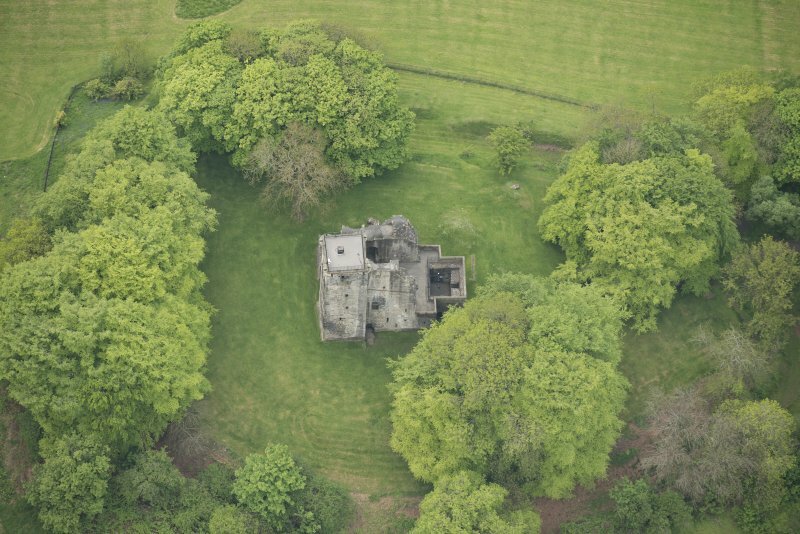 The survey has brought to light new evidence for the location of the lost chapel, built by Sir Robert Croc in the late 12th century, within the bailey or courtyard of the castle. Coupled with this, it shows that the original 12th-century castle was not of a motte and bailey type as previously suggested, but was instead a ringed defence work. Outside the present limits of the castle a circular enclosure has also been discovered below the surface; this suggests continuity of settlement prior to the 12th century. The circular enclosure is c 20m in diameter, with internal structures of some type, situated on the summit of the hill. It looks not unlike the small Iron Age duns with outworks observed in Argyll, but the Crookston walls are only about 1m thick, and may be a Dark Age ring work or fortified settlement. Rig and furrow marks are apparent on both the N and S sides of the hill, indicating agricultural use, possibly once the castle went out of use in the 16th century or later. Copies of the report have been lodged with Historic Scotland. NS 525 627 Archaeological monitoring was undertaken in February 2005 at Crookston Castle (NS56SW 4) while contractors dug a trench, c 85m long, from the lodge house to the castle for an electricity supply cable. Since the trench almost entirely did not penetrate beyond the topsoil, very little of archaeological significance was discovered. 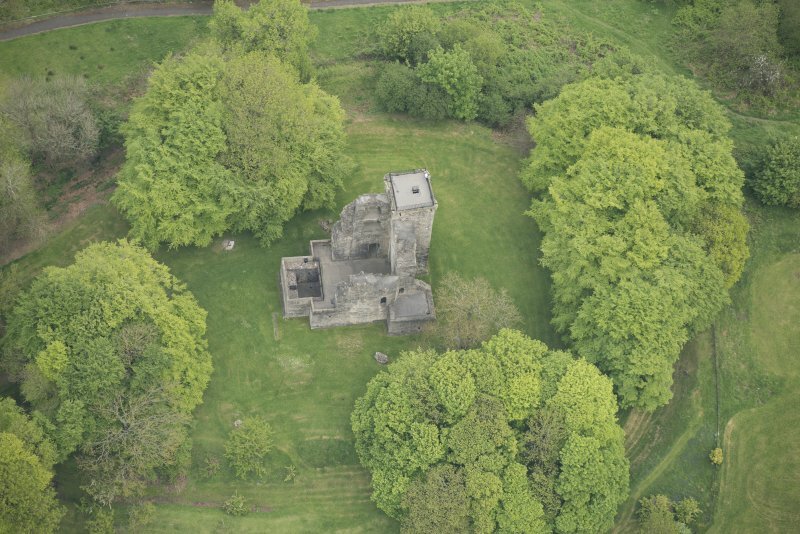 However, it is possible that an area of stone and mortar, 5m N of the projecting corner turret at the NW corner of the castle, represents the remains of a structure associated with the 15th-century tower which had fallen out of use by the end of the 16th century. Watching brief NS 5255 6272 The construction of disabled parking bays by the entrance to the castle were monitored in April 2005. No archaeological remains or artefacts were discovered. Report lodged with WoSAS SMR and NMRS. Sponsors: Carts Greenspace, Renfrewshire Council. Box 36 c.1890 RCAHMS 1959. George Stewart Sketches - 1 pencil drawing, June 1865. 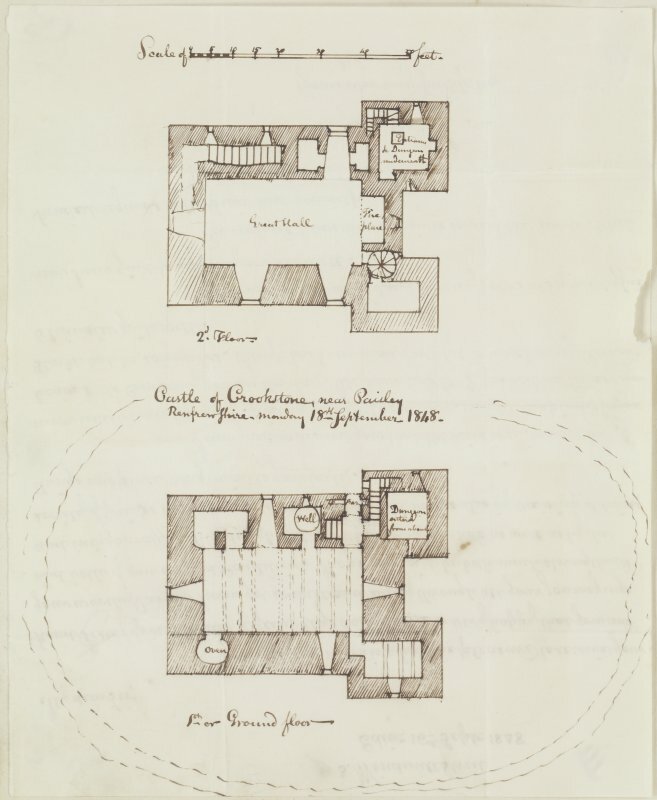 Crookston Castle by Robert Guy - text, plans and photographs (D5/RE3). Excavations at Crookston Castle, text. Mitchell Library, Glasgow: 'Glasgow in Former Times II' - pencil and wash sketch. 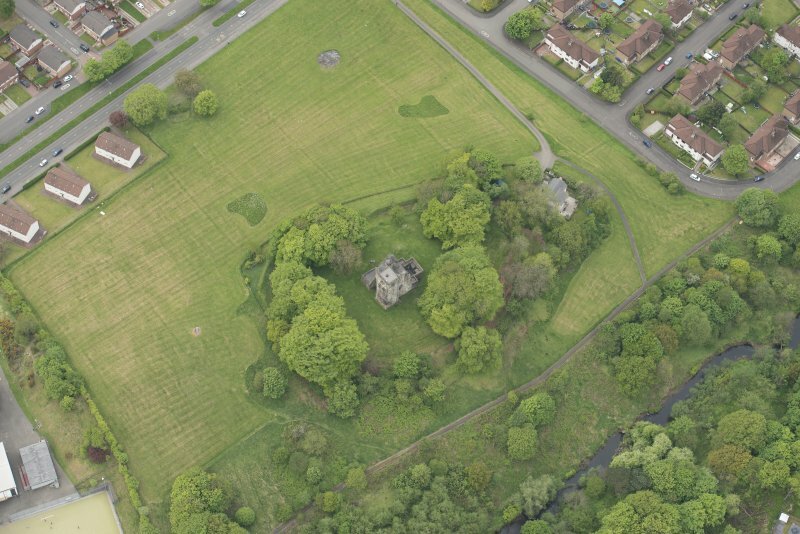 Crookston Castle is situated on the top of a hogbacked knoll which offers a magnificent prospect over the Clyde to the higher ground beyond, and it is protected on the north by a steep drop down to the Leven Water. The defences belong to two main periods, a ringwork of 12th century date and a later medieval tower-house of unusual design. 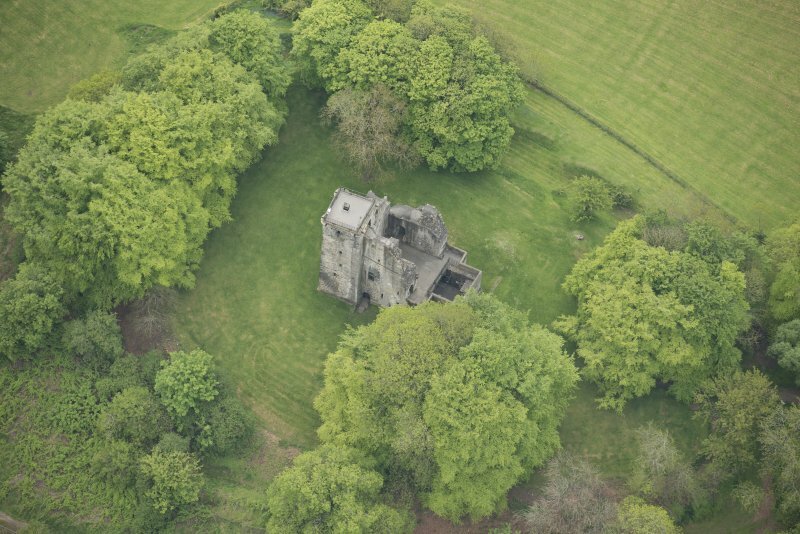 The castle takes its name from Sir Robert Croc of Neilston who held the lands of the manor in the latter part of the 12th century, and it is to this period that the earthwork defences probably belong. 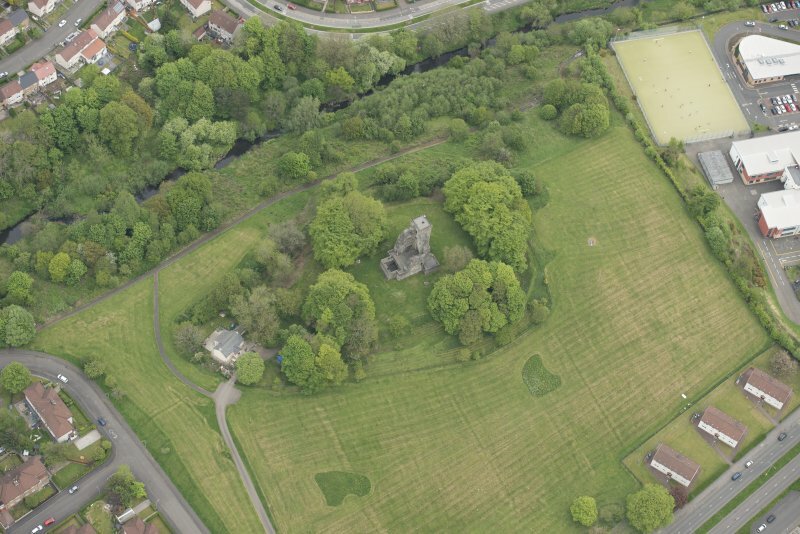 Although the site has in the past been described as the remains of a matte and bailey castle, excavation has shown that there is no evidence for the existence of a motte, and the earlier medieval defences are best described as a ringwork. The enclosed area is roughly oval on plan, measunng 80m by 45m within a broad ditch accompanied by a counterscarp bank. There is little sign of an inner rampart or stone wall, and a timber palisade probably provided sufficient defence. The single entrance lay on the west, under the modern track, and the interior buildings, like the palisade, are likely to have been entirely of timber. 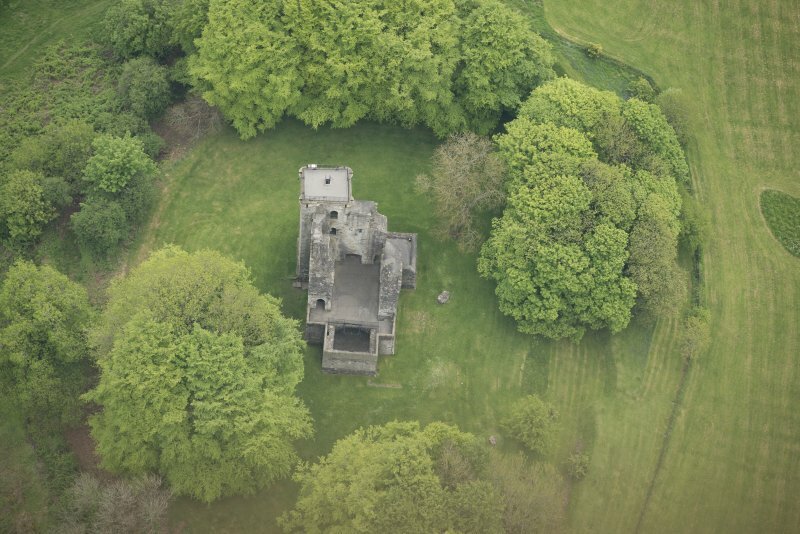 The tower-house, which is of early 15th century date, is of unusual plan and finds few parallels elsewhere in Scotland. Before deliberate partial demolition in the late 15th century, it consisted of a central rectangular block with four projecting angle-towers. Only the north-east and south-east towers now survive, giving the castle an unbalanced and ungainly appearance, although originally it must have been a handsome, if not formidable looking building. The principal accommodation lay in the central block, with the ground floor occupied by a barrel-vaulted cellar, a large hall on the first floor and a solar above the hall; the angle-towers contained smaller apartments and the service rooms. The design of the castle and the masonry are of a high order and some of the work has been likened to that at Borthwick Castle, Midlothian. The castle was besieged in 1489 and the renowned cannon known as Mons Meg (now preserved in Edinburgh Castle) was dragged from Edinburgh to take part in the assault. Following the capture and slighting of the castle, it was re-occupied and partially restored, but before the end of the 16th century it seems to have been deserted.